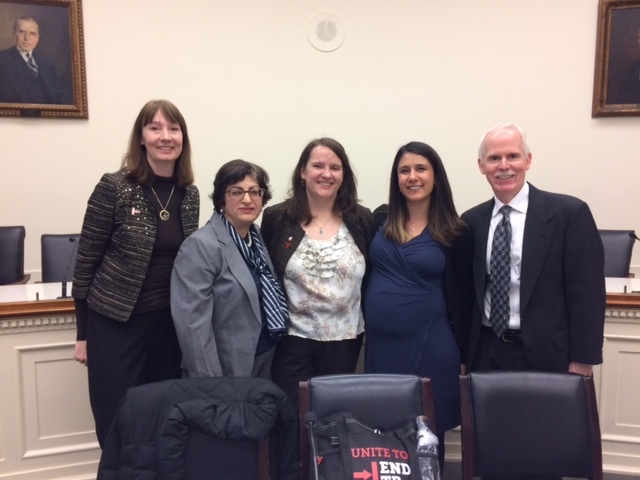 The ATS cosponsored a series of events on Capitol Hill this week with partners, including the National Tuberculosis Controllers Association, TB Alliance and RESULTS to commemorate World TB Day. On March 20, over 20 TB survivors and advocates from around the country traveled to Capitol Hill to participate in the third annual “TB Survivors Hill Day.” TB survivors from states including California, Colorado, Michigan, Alabama and Vermont met with their congressional delegations to call for increased funding for global and domestic TB programs at the CDC and USAID, and increased TB research and development at the CDC, NIH and BARDA. Philip A. LoBue, MD, director, Div. of TB Elimination, National Center for HIV/AIDS, Viral Hepatitis, STD, and TB Prevention, CDC. TB survivor Kristen Virdone gave a moving account of her struggle with tuberculosis diagnosis and treatment and called for more funding for TB programs to eliminate the disease. ATS member Diana Nilsen, MD, who chaired the panel, described the challenges that state TB control programs face in controlling and preventing community transmission of the disease in the face of significantly reduced federal funding. On the evening of March 20, ATS and partners held a reception on Capitol Hill to honor TB Caucus co-chair, Rep. Gene Green (D-TX), for his leadership on TB legislation and funding. Rep. Green is retiring at the end of this Congress. Nuala Moore, associate director of government affairs in the ATS Washington Office presented Rep. Green with an award from the Tuberculosis Roundtable, the DC-based TB policy coalition co-choired by the ATS, for his leadership on TB policy. 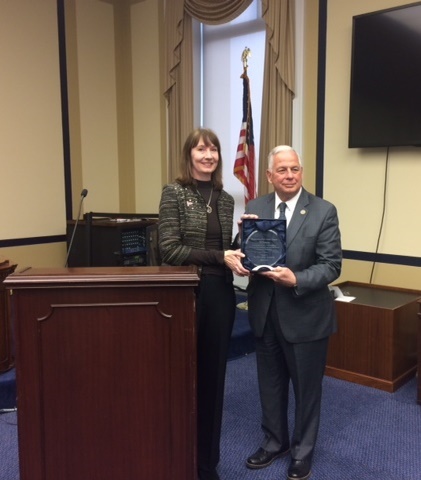 Nuala Moore, ATS Washington office staff presents TB Caucus Co-chair Rep. Gene Green (D-TX) with TB Champion Award.